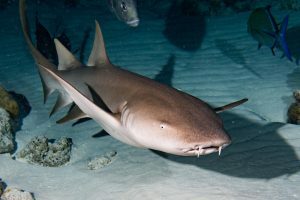 Species Profile: The Nurse Shark - We Love Sharks! Species Profile: The Nurse Shark - We Love Sharks! The nurse shark has a broad head, a small mouth with rows of serrated teeth and a tail fin that is almost a quarter of its entire body length. Though the name is benign; this fish packs an intimidating array of rows of sharp teeth and a painful bite when provoked. It’s one of the shark species that can pump water over its gills when it is stationary. As a result of this characteristic, it does not need to swim continuously to breathe. Nurse sharks are exceptionally sedentary and do not migrate, unlike many other shark species. Nurse sharks can live for up to 25 years. They weigh from 200 to 330 lbs (90 to 150 kg). Nurse sharks are slow and sluggish; their exact swimming speed is not documented. These sharks are docile, slow-moving bottom-dwellers and are generally considered harmless to humans. There is no record of a fatal attack from a nurse shark to date. But since they can grow to be quite huge, and have very strong jaws filled with rows of thousands of tiny, serrated teeth, it’s advisable to interact with them cautiously. Certainly, they will bite and injure you quite painfully if you stepped on one, for instance. Nurse sharks are ovoviviparous. Their young are hatched from eggs within the body of the mother sharks. They mate every two years from late June to the end of July. The gestation period is six months with a litter of 21 to 29 pups on the average. Their young cannibalize each other, and the larger pups will eat the underdeveloped ones. After that, the pups are born fully developed with each one measuring about 30 cm (12 in.) long. They reach maturity at 15 to 20 years old. Nurse sharks will return to the same breeding grounds again and again, and they are one of the few shark species that exhibit this kind of mating site fidelity. Nurse sharks are solitary, nocturnal fish, and they spend their nights, rifling through sediments at the ocean floor in search of food. Their primary diet is small fish, stingrays, spiny lobsters, crabs, shrimp, sea urchins, octopi, squid, and marine snails. Nurse sharks are powerful suction feeders that can generate almost the strongest suction forces among aquatic vertebrate to date. Though they have small mouths, that won’t stop them from seizing chunks of prey with their teeth and shaking their heads violently to reduce the size of each piece. This species is considered as one of Least Concern in the U.S. and Bahamas but is classified as vulnerable in the Western Atlantic, South America and in many areas of Central America and the Caribbean. Globally, it’s assessed as Data Deficient since figures are not reliable across its range in the Eastern Pacific and Eastern Atlantic. Commercial fisheries do not commonly hunt the nurse shark. However, the skin is very tough and is used for high-quality quality leather products. Also, their liver oil is useful too, so some fisheries do go after them. Their slow speed makes them quite easy to catch. Evidence from morphological similarities shows that the nurse shark (Ginglymostoma) is likely the sister genus of the tawny nurse shark (Nebrius). Both of them are placed in a clade (group) that includes species like the short-tail nurse shark (Pseudoginglymostoma brevicaudatum), the whale shark (Rhincodon typus), and the zebra shark (Stegostoma fasciatum). Nurse sharks have a wide geographical distribution, and they prefer the tropical and sub-tropical coastal waters of the Eastern Atlantic, Western Atlantic, and Eastern Pacific. In the Eastern Atlantic, it thrives from Cape Verde to Gabon. You can find it in the Western Atlantic, from the Caribbean to Rhode Island and on to southern Brazil. While in the East Pacific they thrive from Baja, California to Peru. These are non-migratory fish, and instead of migrating in cooler weather, they adapt to colder temperatures by decreasing their already low metabolism and activity level. They like to dwell on the sea floor in warm, shallow waters. Therefore, they are frequently found at depths of one meter or less but can go down to 12 meters. Juveniles prefer the bottom of shallow coral reefs, seagrass flats, and in channels around mangrove islands. Older sharks of the species typically seek shelter in crevices and under ledges in and around deeper reefs and rocky areas during the day, coming out to feed at night. They are abundant wherever they are found and they have no special conservation status. But closeness to human activity and their valuable skin means they are sometimes victims of bycatch and selective hunting. These activities are gradually putting pressure on the species.